This book by renowned jazz guitarist and educator Jody Fisher, now in a standard-notation-only edition, is great for guitarists who have learned the basics of jazz harmony and improvisation. Topics include the ii-V-I progression, solo lines, altered chord formulas, and comping in various jazz feels, such as Latin, swing, ballad, and even funk. Continuing the format of Beginning Jazz Guitar, every new concept is accompanied by etudes and songs for practice, with every chapter clearly divided into harmony and improvisation lessons. 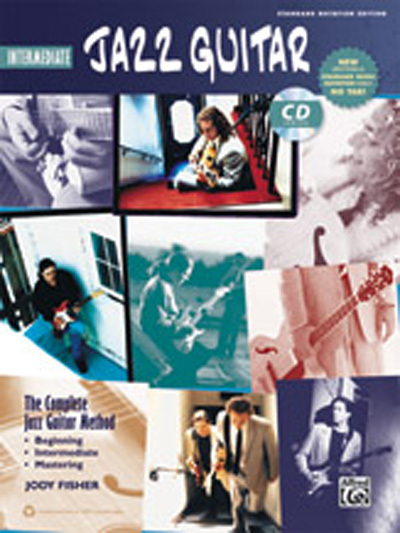 Packed with hundreds of chord voicings and improvisation ideas, this book is a must for any serious student of jazz guitar.